Team SEQ is in a great mood! Over the last few weeks, we had an awesome run of successful events, the weather has perked up, summer Friday's are just around the corner, our July / August calendars are filling up and pending vacations dangle in front of us like carrots! Aaahh, to be a kid again! Remember this time of year during your senior year of high school? Classes were winding down, driving (or racing) through town with the music blaring, everyone had picked their college of choice, yearbooks were circulating, graduation party plans were made and... PROM. Not a single care in the world except for the biggest event of the year - the final hurrah! Our in-office chatter about our individual proms was so funny, we decided to take a trip down memory lane and dig up our old prom photos. Which brings us to our first SEQ CHALLENGE (and yes, it involves a prize). We're pretty sure it won't be hard to guess who is who, so we've made it a bit more fun. 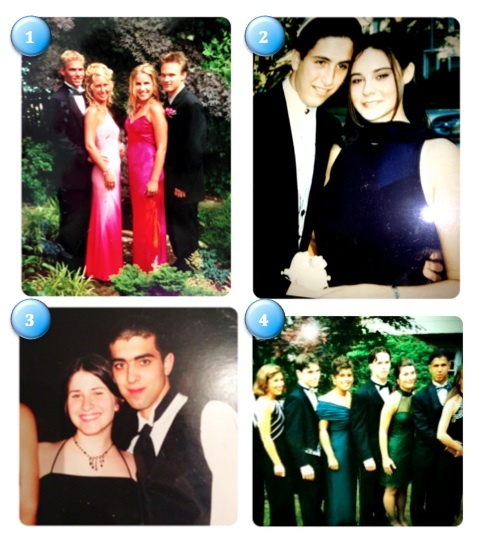 The first person to correctly identify each of our photos AND our high school graduation years AND name one song that remind us of our proms from that year- will get to choose a pretty sweet prize from our surprise stash of swag! Woo-hoo! Ready to get started with Sequence?